Sushi is life and a definite staple in mine and Christopher’s diet. We even have a doormat that says so! You can find the one we purchased here or some other ones I like such as, this one and this one. When we started the keto diet recently, one thing that lingered in our minds was “holy crap...sushi...what do we do? !” We couldn’t give up sushi. We eat way too much of it and would not be able to deprive ourselves of it, no matter how hard we tried. While we’ve been doing fairly well with meal prepping and only cheating once or twice on the weekends (Banner’s boneless dry rub wings are to die for), the sushi craving finally kicked in this weekend and at a time when I had nothing prepped. So I obvs had to break down and order some for delivery. The great thing about the keto diet though, is that as long as you find foods high in fat and low in carbs, you’re good. You may have to look at a restaurant menu a little longer and pull your phone out to Google certain ingredients, but it is in fact possible to eat keto almost anywhere you go. So I Googled. I searched the nutritional info for tempura (my favorite! ), soybean paper, rice paper, and a few other ingredients. Although I technically could eat tempura as long as my daily carb intake stays below the number it should, I chose to stray away since I had wings last night (oops). When Christopher and I order sushi, we basically always gravitate towards the same menu items we like the best. I love shrimp tempura rolls and he loves traditional tuna/salmon rolls. The fun thing though about trying to find keto approved sushi is that you’re forced to try new things! 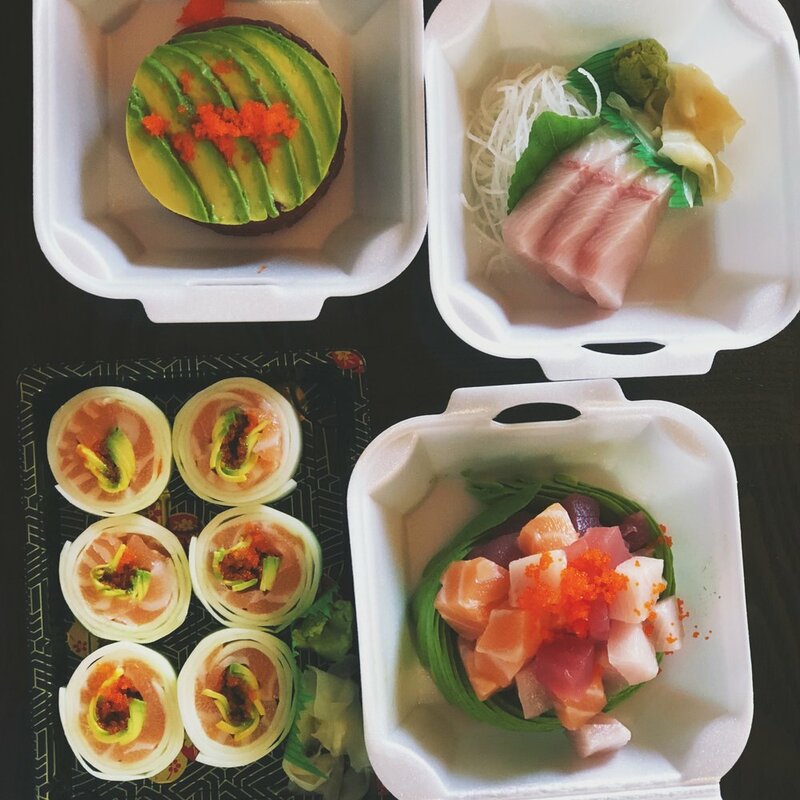 After doing a little menu reviewing, I ordered sushi for delivery from one of our favorite local sushi joints, Osaka. We got Yellowtail sashimi, Bluefin Tuna Tartar, a Long Island, and a Salmon Naruto roll. The Salmon Naruto roll has salmon, avocado, & tobiko wrapped in cucumber slices, and tastes just as refreshing as it sounds! The Yellowtail sashimi is just slices of raw yellowtail. The Bluefin Tuna Tartar is diced bluefin, green onions, and chef’s special sauce, topped with sliced avocado & tobiko. The Long Island has diced Yellowtail, tuna, and salmon with sliced avocado and chef’s special sauce. All were INCREDIBLE! Although, we have had the sashimi countless times and already knew we’d like it. Either way, we made some smart and careful decisions so that we could keep our meal as keto as possible AND we still got to enjoy a full sushi dinner!